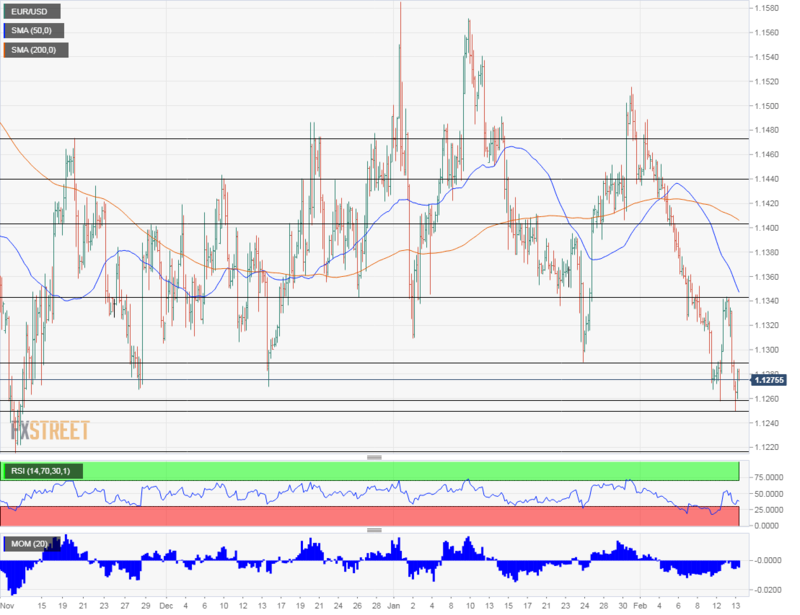 EUR/USD is attempting to recover below 1.1300 on trade hopes, despite German weakness. US retail sales stand out on Valentine's Day. The technical picture looks bearish for the pair. EUR/USD is trading below 1.1300, off the fresh two-month lows below 1.1248 but below the highs seen on Wednesday. Germany reported a 0% growth in Q4 2018. This stagnation was worse than an increase of 0.1% expected and coming after the continent's locomotive suffered a squeeze of 0.2% in its economy in Q3. There is one silver lining, with YoY growth coming out at 0.9%, slightly above expectations. The euro-zone will later publish an updated GDP estimate for the last quarter. A confirmation of the 0.2% QoQ is on the cards, but a downgrade cannot be ruled out after the data from the largest economy. The German disappointment contrasts the better US data. Core CPI rose by 2.2% YoY in January, a tad above projections. The data could push the Federal Reserve to raise rates. The US will publish retail sales today. The data is for December, delayed due to the government shutdown. And it can be surprising. Optimism comes from reports that the US may push back the deadline to reach a trade deal with China by 60 days. Negotiations continue at a top level today with Treasury Secretary Steven Mnuchin and Trade Representative Robert Lighthizer meet Chinese PM Liu He in Beijing. They may also meet Chinese President Xi Jinping. So far, both sides did not make enough progress on issues such as the Chinese government's involvement in the economy and intellectual property. Fears that the US may impose fresh tariffs on China have now faded with the news of a potential delay. Another negotiation led by President Trump is not a done deal. Republicans and Democrats clinched an accord to fund border security, unlocking a pact to keep the government open. However, sources on Capitol Hill suggest that the White House opposes paying contractors that were not paid during the recent government shutdown, the longest in history. Back in the old continent, Spaniards will go to the polls, probably in April. The minority government led by PM Pedro Sánchez failed to pass the budget and will announce the election date on Friday. So far, the euro did not feel the political crisis in the fourth-largest economy. The four-hour chart shows that Momentum remains to the downside while the Relative Strength Index (RSI) is still above 30, thus not indicating oversold conditions. The pair trades below the 50 and 200 Simple Moving Averages, also pointing to the downside. Initial support is at 1.1260, around the initial two-month low seen early in the week. The fresh trough of 1.1248 is close by. 1.1215 was the lowest point in 2018 and significant support. The next lines date back to 2017: 1.1200 and 1.1115 are eyed. 1.1290 is the January low and is the immediate resistance line. Further up, Wednesday's peak at 1.1340 is the next cap. 1.1405 was a swing low several weeks ago and is also where the 200 SMA meets the chart.